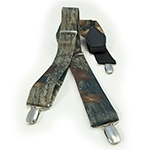 Mens Camouflage Suspenders - Synthetic Fabric, Mylar Clip. Boys Camouflage Suspenders - Synthetic Fabric, Mylar Clip. Whether you are looking for Camouflage Suspenders or a black silk bow tie that you tie yourself, you are in the right place. We sell Camouflage Suspenders at an affordable price with high quality at no extra cost to you. Camouflage Suspenders are a great way to add that special touch to your attire.